Having slow loading website means bad impression on users and search engine as well. Thus, optimizing your site or blog is essential for having fast loading website that creates the better user experience and acquires a good position on search engine. Noticing such suggestion might make you search the term on the web. So let’s start with the introduction. To make things easier, here, I will penlight some plugins to fix this issue. 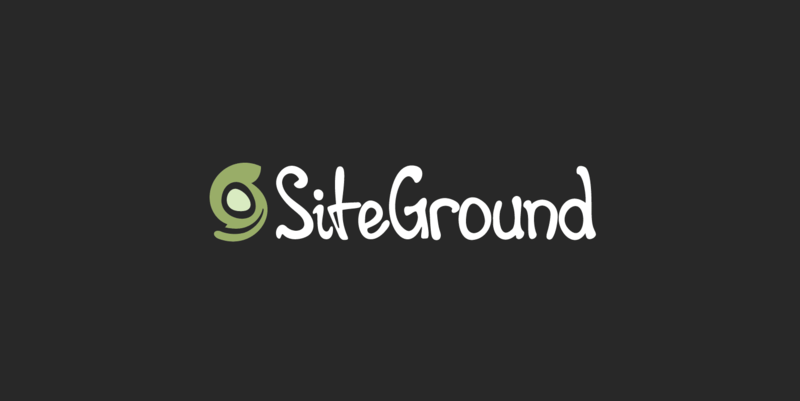 The fascinating feature of this plugin is, it merges JS and CSS files into groups to reduce the number of HTTP requests. Moreover, it handles all those scripts that are loaded in both header and footer. After that, it then sorts them once you exclude some files from minification. 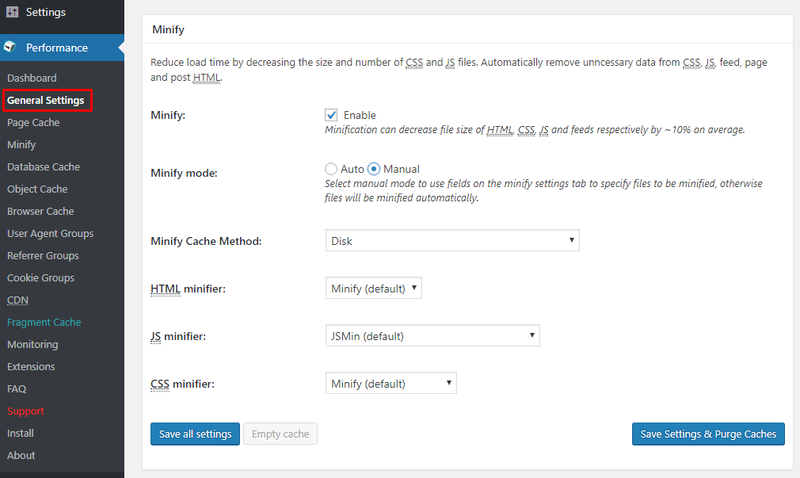 The plugin does minification of CSS and JS files with PHP Minify only. It also does supports localized files. 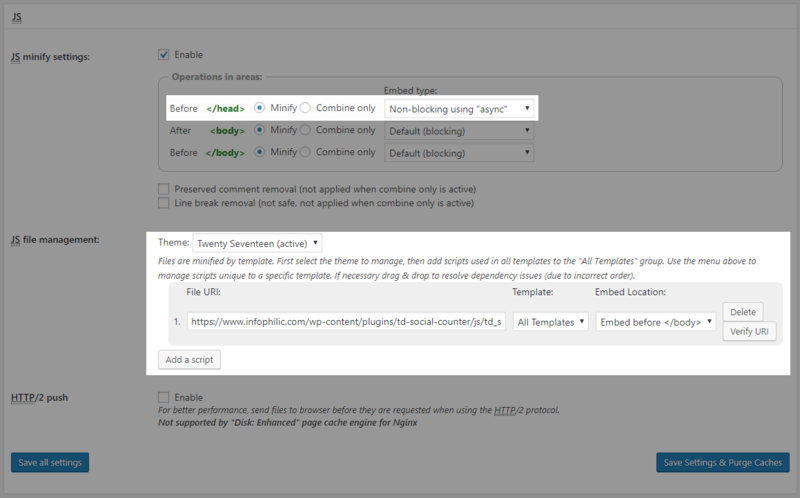 Configure the options under Settings >> Fast Velocity Minify and that’s it. Autoptimize is one of the most powerful and easy to use plugins for minification. The plugin makes optimization easy by aggregating, minifying and caching scripts and styles, injecting CSS in the page head by default. It also minifies the HTML code itself, making your page really lightweight. There are advanced options and an extensive API available to enable you to tailor Autoptimize to each and every site’s specific needs. Go to WordPress dashboard > Plugins >> Add New >>> Autoptimize. Now, go to Settings >> Autoptimize. Enable the minification settings on the settings page. 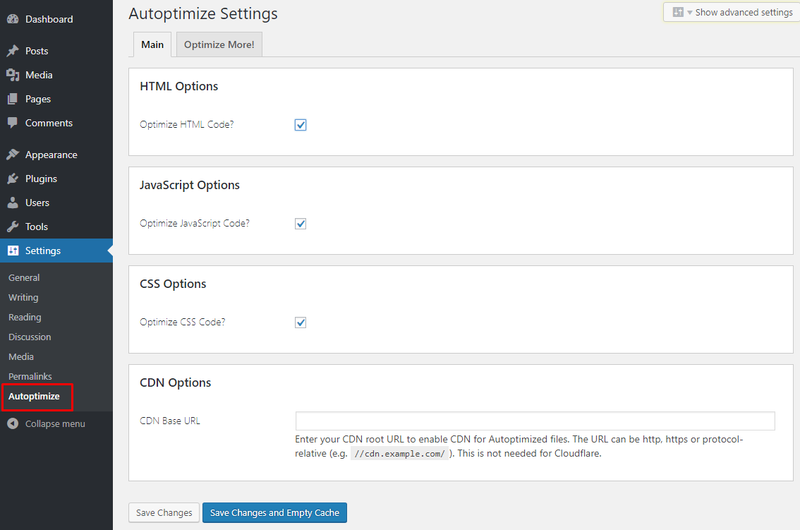 You can also add your CDN URL for the optimized assets on the same page. If you don’t use CDN you may skip it. Now click on Show advanced settings button at the top of the setting page. 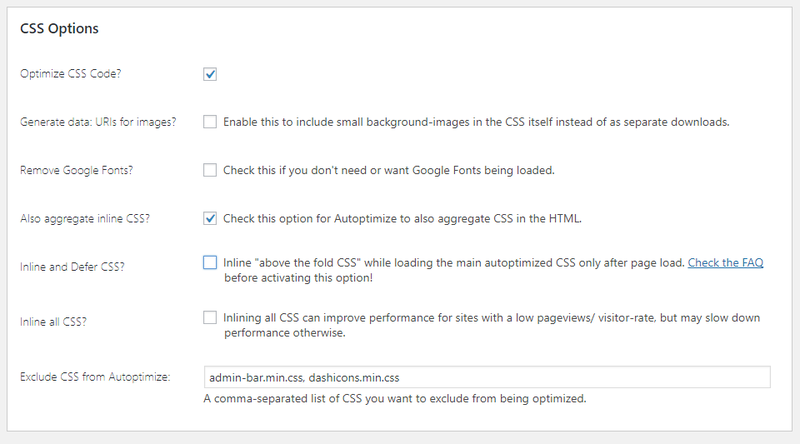 This will enable advanced setting page for Autoptimize plugin. Visit Performance » General Settings page and scroll down to Minify section. Check ‘Enable’ next to Minify option. Select ‘Manual’ for minify mode option. Now, add the scripts and CSS that you want to minify. 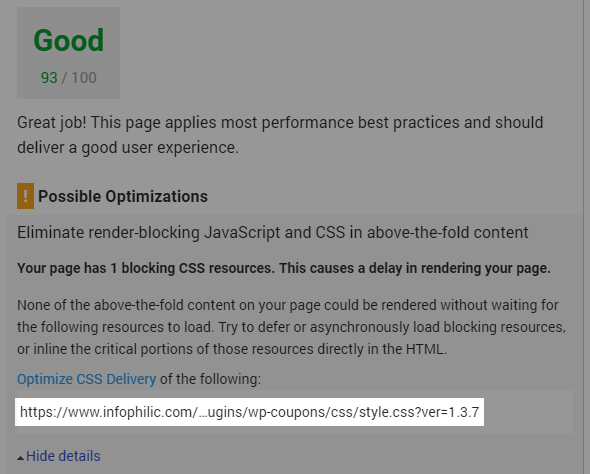 Get URLs from the Google PageSpeed Insights tool’s result page. For this, test your site speed in Google PageSpeed Insights tool. It will recommend eliminating render blocking scripts. Click on Show how to fix and it will show you the list of scripts and stylesheets. Take your mouse over to a script and select the URL. Scroll down to JS section and then under the ‘Operations in areas’ set the embed type to ‘Non-blocking async’ for the </head> section. Under the JS file management choose your activated theme. Now Hit Add a script button and start adding script URLs. Once done, Go to CSS section and then click on the ‘Add a stylesheet’ button. 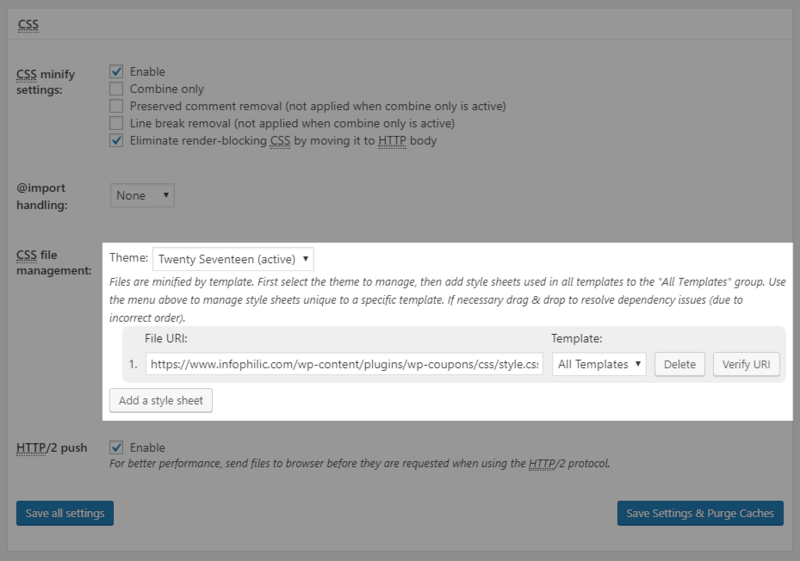 Add stylesheet URLs that you copied from PageSpeed tools. Refer the screenshot below. After making all the necessary configuration click on the ‘Save settings and purge cache‘. Now, Test your site speed at Google PageSpeed Insights tool. The desktop score is good but mobile score suddenly drops from 93 to 75 in Google Pagespeed insight. Hey Subodh, Speed optimization is not about getting good scores on the tools. It’s about how your site loads at your users end. If you wanna remove render blocking scripts you can use any tool suggested in the post.